Something must be in the water in Manhattan Beach because I have a close friend who is having a baby every month until the month of December (I'm included - due in October!). That being said I made mexican Xolchi soup for my friend Julie who just had a little boy this week. It is such an easy healthy recipe that both moms, dads and big siblings like. I basically made up the recipe but it is based on a soup you can get here at a restaurant called El Gringo. Start by sauteing the 2 cups of diced onions with the 3 tablespoons of olive oil in a large soup pot (one you would use to boil spaghetti). 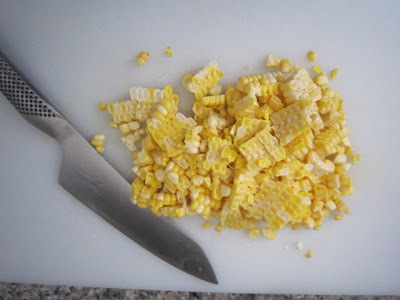 Saute for about three minutes until the onions are slightly translucent, then add your two ears of shaved corn (see photo below to get an idea of what the corn looks like cut raw of the cob) and one clove of chopped garlic. Also add a pinch of salt and pepper to help bring out the flavors of the vegetables. Now add the 8 cups of chicken broth to the onion and corn mixture. Once the broth is warm throw in the chicken and 1/2 tsp of ground cumin. Simmer the soup for 15 minutes. Add 3 cups of pre-cooked mexican rice (day old is fine). Simmer for another 10 minutes so that the rice can get nice and fluffy and absorb the broth and spices. While this is simmering, chop your tomatoes. Now when cutting tomatoes for soup, I don't like having any seeds, so cut the meaty skin off the tomato vertically in four long strips. This way the seeds stay in the center with the core. Then chop the outside of the tomato into a dice (see photo below of the left over core, the dice, and a whole roma tomato). After the soup has simmered for 10-15 minutes after you put the rice in, turn off the heat and throw in the tomatoes. Let the soup stand for 5 minutes before serving or let cool and re-heat for later. Now don't forget the garnish. Cilantro and avocado are a must and sour cream and shredded monterrey are optional. Serve with coronas (I like the mini Coronitas) and fresh tortilla chips. 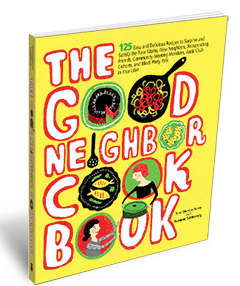 Now if you are looking for your own signature "take over" dinner, The Good Neighbor Cookbook is a wonderful source for easy and delicious recipes to satisfy new moms, new neighbors, recuperating friends...etc. in your life. This looks delicious Andrika! Makes me homesick for El Gringo.